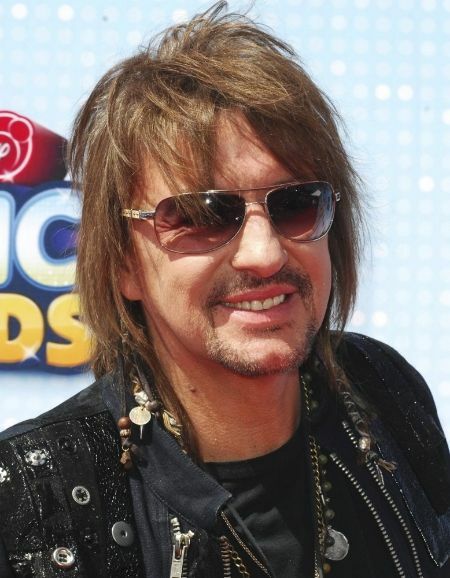 Richie Sambora returns to Belfast for the first time in over 20 years when he plays at the Ulster Hall on 1st July. 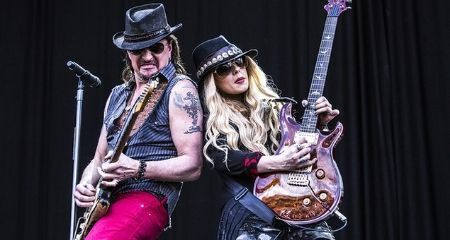 The Belfast date is part of a European tour that sees Richie playing alongside guitarist Orianthi and follows a number of successful shows in Australia and the USA. Read the transcription of the interview below. There’s an interview with Orianthi recorded just before the gig on 1st July here - http://www.rockradioni.co.uk/interviews/1587-ni-rocks-interview-with-orianthi.html - there are also videos and pictures from that gig at the same link. DARREN - Hi Richie, thanks for speaking to us. DARREN - It’s been 21 years since you played Belfast, are you looking forward to the Ulster Hall show? RICHIE - Yeah man! Absolutely, I remember that show very very vividly, you guys were having some problems back then, you know? I remember showing up man, and it was a very very heavily armed area at that time you know. But music is the anecdote to all of that. And you know I mean it’s a mirror sometimes to the culture, to what’s happening economically, emotionally. Music holds all of that, it holds anarchy, it holds the joy, it holds the pain, and you know what it’s done for me throughout the years, and it still does, all the time, it makes me feel like I am not alone. And I think that an important part of what I take seriously about my job. DARREN - I think that’s pretty spot-on, yeah, especially growing up here, that was always the one thing that pulled everybody together, you went to a rock show, and nobody cared who you were, or what you were. RICHIE - Exactly, its music man! It’s like everybody, everybody, it touches them somehow. I felt that you know, always through my life, even as a young man, as a young musician, I always felt there was some kinda nobility, centred in my desire, in my passion for what I do. And I still have that. I think I haven’t even worn out, it’s crazy. I can’t get away from a guitar or piano these days it just seems, and the songs are just coming out of me man, I’m just writing and writing and writing. DARREN - That was actually one of my questions was gonna be that over the last 6 month you just seem to be having such a blast out with your solo stuff, and with Orianthi. The question was would that be fair comment, but you seem to have answered that already. RICHIE - Oh absolutely, oh man, are you kidding me? Well, you know first of all, there’s freedom there, obviously. One of the main things I felt that was missing in music, over the past years, and also in Bon Jovi, actually that there wasn’t enough room to improvise, to have that moment where you can actually lose yourself musically, what I have done is to assemble an amazing group of musicians, and I did this also on the “Aftermath” record, if you listen to my last record there’s a lot of extended soloing going on. I asked the guys in my band to be artists themselves, please, all the input, bring all the input you can, do everything you can. And now working with Orianthi, when we first met, and we jammed together, there was fireworks. It was natural, it was just natural. It was unbelievable. As luck would have it, or destiny would have it actually. What happened was I got asked to do all these festivals down in Australia. RICHIE - And so I put a couple of solo shows on sale around that obviously, and four days before we left, my rhythm guitar player’s mother fell ill, and I needed to have another person, so I called Ori, and she was available, and I said do you wanna come, and she says yeah, and we blew it up! DARREN - Yep, I’ve seen the videos, and you also managed to squeeze in “Purple Rain”. RICHIE - Yeah yeah. You know its fun again, and when you get creative like that, and that was an important part of why I first started to want to be a musician in the first place. I’d seen Hendrix, Paige, Eric Clapton, all the guys that are out there, Jeff Beck, Carlos Santana, people that were playing and emoting through the instrument. You know it was an important part of my growth as a musician, besides obviously the song writing end of it, from Bob Dylan, The Stones, The Beatles, was such a great time to grow up, late ‘60s, early ‘70s. I felt that I was privileged enough to grow up in the renaissance of music because at that point there were so many genres that were flourishing, whether it be Folk, or pop or heavy metal, or just Punk. I was in a couple punk bands you know so, I was just very lucky to have all that influence and all that stimuli, and it really made me enjoy it all too, I wasn’t stuck in one genre, I just loved everything, I went to see every show, I didn’t care if it was a jazz show, folk show, blues show, rock show, whatever it was, I went to see it. I mean I went to see a lot, because I lived next to New York and everybody good plays in New York, and I was lucky enough to have a buddy who worked for one of the prominent promoters John Scher there, and so I saw everything and everyone. I try to get to every concert I can, I go to Coachella every year, I try to hit the festivals cos you get to see 30-40 bands at a time. And yeah, it’s a very amazing contrast of genre, and there’s new bands, old bands, electronica, rap, this that and I just try to absorb it all. DARREN - It just sinks in. RICHIE - I went to see Black Sabbath the other day, they were fantastic. RICHIE - That new drummer, huh? Wow! Just awesome! Ozzy and Sharon and I have been friends for years. I’m actually opening up for Ozzy in Seoul Korea, in August. So that’s gonna be a lot of fun. I’m doing all these festivals and some of them are very diverse, and other are just kinda like heavy. DARREN - Yeah, I’ve seen that one with Psy, the guy that does Gangnam Style, in Korea. RICHIE *laughs* It’s crazy you know. Like you know Soundwave down in Australia was very very heavy, and you know obviously I can get very heavy, so I went a little bit heavier on people, but the thing that really got the people and got the reviews, was the jamming end of it and the improvisational end of it and watching musicians speak to each other through the language of music. DARREN - I think that’s been pretty clear through the YouTube videos. RICHIE - I think also its missing you know. RICHIE - You know the younger bands don’t do that as much, they just don’t, I don’t know why. DARREN - Looking for the quick buck. RICHIE- When I picked up the guitar, that’s the reason I wanted to do it. It’s something sexual in there too, you are digging in deep, and finding some deep place in yourself where you are able to spiral out music, with your heart and fingers. That’s when I come on the road, that’s what I bring, and all the people in my band, and Ori obviously too. NIGEL - I’ve a couple of quick questions just for you about Orianthi, I know you’ve been talking to Darren, about some of that stuff already. You’ve been writing with Orianthi, how’s the writing process going and when might we expect to see that album? RICHIE - You know, I’ll tell ya, the greatest part about it is, first of all I think it’s an anomaly because it’s a man and a woman, I think that most male guitar players might be afraid, to play with her. But see we compliment each other so well, so hey look, I’ve been doing this for a long time, and the thing that I obviously, I’m technically proficient also but, I have a very deep heart, and we dig down deep. So that covers the soloing, and the riff department of what songs are. We’ve written songs about our common humanity, about what’s happened to relationships in our lives, how did we get, how could I say it, F’ed over by record companies, how did some of our music fall into the cracks, we know what this feels like. Freedom, that’s the kinda things we are singing about. The artistic freedom to do what we wanna do, and I think the best way I can put it is really both of us have the dexterity to cover many many genres, both as vocalists, and song writers and singers, and obviously guitar players, so its kinda like a modern day Fleetwood Mac, on steroids. NIGEL - I like the sound of that! RICHIE - You know it cool, it’s interesting, cos it’s Eden, you know, its man and woman, it’s the blood of Eden man. And it’s flowing, the songs are just coming. Obviously we think they are great. And so I checked. Throughout these last thirty some odd years, being a professional at a very high level in my business, I have made a lot of friends, be artists or engineers, or producers and stuff like that, and they are like “No, you got it man”. We got some of the good stuff cooking. I had those two choices, I could have went into the studio and started recording immediately, or take the band out and even get them a little bit more tuned in, and as a leader I decided to take them into battle first, you know before we started recording. So that was the mindset, of being a general and being a leader in this band. NIGEL – Who else will be working on the album with you, will you have any special guests on the album? What’s the line up going to be? RICHIE - You know, it’s in such an embryonic stage, obviously, well look I just played with Stevie Wonder not too long ago; I mean how cool is that?! He’s been my singing idol and song-writing obviously for a long long time, and then there’s the Buddy Guys, and the BB King’s, some of those blues guys. I’ve written with Bernie Taupin in the past, so he will be a guest song writer on the record for sure, I just think he’s unbelievable, and it was an honour to work with him. So yeah, by happenstance, you just kinda run into people when you are in studios, and just say hey come on over. So you never know. The first thing I do when I walk into a studio, is see who’s in the other studios, so I can go talk to them, and hang out you know, see who’s around, and I end up playing on other peoples records, and then they end up playing on mine too. And you know you run into people when you play these festivals, so you never know who I am going to ask to come and write, or jam, or do whatever, so you never know. NIGEL - Just one last question before I hand you back to Darren, I noticed on twitter you were looking for people to support you on tour in Germany, singer songwriters etc, will you be doing the same in Belfast? RICHIE - Yes, I wanna do it, matter of fact, my next phone call will probably be that. Yeah I am always looking to give new artists, especially songwriters a leg up, give them a good chance to go out and show their wares to people. NIGEL – Yeah, it’s a great opportunity for them. RICHIE - Look people have done that for me, it is a way of giving back in that respect. Throughout the years we’ve found many bands that we’ve brought up. I think it’s a noble thing to do. NIGEL - That’s great. Thanks very much. DARREN – Last week, you played a new song “Lighthouse”, was it a benefit you were playing at? RICHIE - Yes it happened, throughout the years, whenever I’m kinda a sucker for anything to do with children, anything to do with things that are close in my community, I work with the Midnight Mission here, taking people off the street and rehabilitating them now for a hundred years, well I’ve been working with them for a decade. And a lot of stuff that’s close to me. My dad passed away from cancer unfortunately, so I did a show in New York, and we raised almost a million bucks, and we put three hospice units on the streets, I put my dads name on them. And they go visit people that can’t even get out of their apartments to go get chemo at the hospitals. So stuff like that you know, its things that are very doable, that you can do as a celebrity, to raise awareness, and if I can do a show or something like that you know. My parents raised me right, put it that way. And that’s very important. What happened was, I was home visiting my mother, I think this was about 4 months ago, something like that and I have friends that are police men, prosecutors, and Mayors, you know, guys I grew up with, prominent people. I aint getting any younger, but I’m feeling younger. There’s this county about ten miles away from where I grew up, called Ocean county, and it’s a small county, maybe 8 sq miles, and 10 to 12 kids a month were dying from heroin, cos it was so strong and so cheap. And so they asked me to get involved and I said of course, what can I do. So I had everyone over to my moms house, and we all started to brainstorm, and we had a few town hall meetings, and I made some speeches, and I did some stuff, and then we put on the show, and this was about a week ago now. It was a 5000 seater, midsize place, obviously we packed it, and there was another thousand people outside and then we streamed and whatever, and I felt compelled to write the song “Lighthouse”. It started out as a song called “Too Many needles on the shore” and I felt it was too dire. I wanted to give some people some hope and some uplifting, so I said well what else is on the shore, a beacon, a lighthouse. The song came out beautifully. I brought out a childrens choir, and I just got a chill thinking about it right now. DARREN - Those kids seemed to be having a lot of fun, I mean, obviously I follow you on twitter, and you are a big of a user of it, and a lot of retweets from the kids who were also amazed at playing with you as you were of the children. RICHIE - Yeah its gonna continue, I am gonna do more shows like that. It’s just part of my thing. Even when I was down in Australia, things were going so well, I had a day off, and the band was having so much fun playing, that’s the other great thing, man everyone was having a gas. And I think that really comes off and people see that. DARREN - I saw the video in the van, I can’t remember what tune it was, but you and Orianthi and someone else was sitting in the back of a van on the way to a show playing. RICHIE - Yeah I forgot what we were playing, we were actually rehearsing a song that we were going to try out that evening. That’s the other great thing, we do a lot of covers. I mean that’s the thing, the heroin, and all that stuff and anything I can do to help people, and do that I think that’s a very important thing,. It’s a very very exciting time for me right now, cos I’m loving music again, I feel like I’m 15, you know when you have that kinda freedom, and also, playing with great musicians. DARREN - You are feeding off each other. RICHIE - Obviously Bon Jovi were a great bunch of musicians also, it’s just that you are playing with somebody for 30 years, you are playing with somebody for 30 years. This has a lot more growth of a quicker fashion, and you are learning more, and things are coming at you quicker. It’s been a great pleasure to already get to this point, now it’s just going to get even better. I’m really really excited. You know when you come out on the road, it’s really to stay in touch with your fans, and your friends, and people that have been loyalist to you for a very long time. DARREN - There’s a large travelling bunch of fans that sort of tend to follow you round Europe, I know that there’s plenty coming from Norway and Germany and stuff to the Belfast show as well. RICHIE - Yeah, sometimes, I guess I can’t make it to those countries in that particular run. You know. So that’s the thing, you know now the pacing for me. Listen man, those 18 and a half month tours man, they were getting a bit too arduous for me at this point. Cos I really like living life now. I did this for thirty years straight, and it’s time for me to actually enjoy some of it, and I find that living life is also part of the song writing process now, instead of being in some boring cocoon for most of the last 30 years. So this has been a great experience for me, and my daughter for me to be home over the last year, and for us to get close. She’s just walked in now, and I’m just very very happy to see her. The only thing I could ask if I had one wish to my Irish fans, is if they could open their hearts and listen and let the music hit them, and let the lyrics hit them, and try to put that in front of the past, in other words, this is a new chapter, it’s like my new exhibition. DARREN - Very good! Have you ever thought about doing a fully acoustic album maybe even just online release, for the fans? RICHIE - Yeah, sure man, absolutely, I mean I honestly have been playing acoustically solo every once in a while round here, just in these little bars. RICHIE - Yeah yeah, you know what, I do stuff in my living room all the time, and I put it up. So you could probably find some stuff. DARREN – I’ve been following it, believe me. RICHIE - Sometimes it’s me and Orianthi, and sometimes it’s me just sitting down at my piano. That’s what we’re trying to do - Orianthi and I - we span the genre globe. Some people try to get there, and we actually authentically and thoroughly do it. Whether it’s an acoustic moment, or a blues moment, or a heavier moment. We’ve ran the gamut of being able to do that. I think the song writing is the main thing, communicating to people, and holding up that mirror, that’s the main thing. DARREN - If you were to pick a show from any time in your career that stands out, one that you wanted to tell the grandchildren about. RICHIE - Yeez, I don’t know man, that’s so hard, I’ve been lucky enough, yeez I mean, god almighty, I dunno. Look at my career over the years! DARREN - Will you be showing them Staying Alive movie? RICHIE - Oh Absolutely. Cos it’s such a goof man, yeah. Hey look man, I don’t mind taking the piss out of myself, you know, I mean that’s half the fun. I heard from a lot of different people that Jimi Hendrix was a really funny cat. And I heard that Stevie Ray Vaughn was a really funny guy. I think that humour is a big part of it. I think I have like 32 odd songs now. I try to write a couple of fun tracks, you know, cos its not all love, it’s not tragedy and blues and blah blah blah. You gotta span the globe, giving the people some fun songs to sing to, that makes them feel happy. Like that song “Happy”. DARREN – It’s a simple song. RICHIE - Let’s talk about hitting the nail on the dead with a hammer right? I think that’s an important part of everything too. When people come to see me, we are going to be spanning the globe of music. DARREN – Thanks very much for your time.